You may be wondering how you can prepare to start at Carleton University in the fall. A first step is to review the CU Start: Transition Guide, an online guide to life at Carleton. CU Start provides an in-depth look at how to prepare for university. In addition to CU Start, students can review the following recommendations and dates. Attend Summer Orientation. Summer Orientation is a one-day program for new students and their parent(s) or guardian(s) that focuses on promoting student academic success and personal development. Get familiar with campus and bus routes. 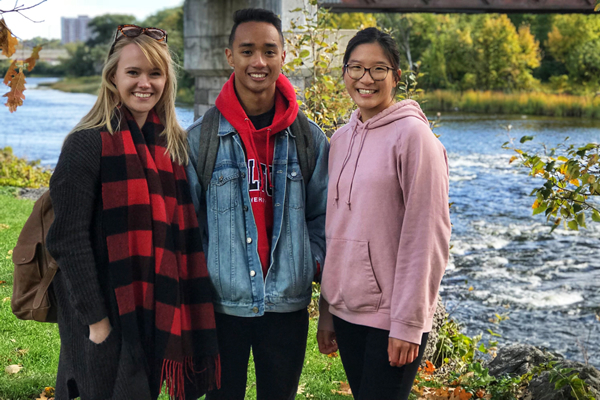 Students can attend a campus tour, view the campus map, and learn how to get to Carleton University. Apply online for your campus card. Visit the Campus Card website to apply online. Students who apply online can pick up their Campus Card and U-Pass (bus pass) when they arrive at Carleton in the fall. Make note of the Carleton University Bookstore hours. The Carleton University Bookstore sells textbooks, Carleton apparel, and school supplies. It is located on the first floor of the University Centre. Review the Dining Services locations on campus. There are many Dining Services locations for students to purchase and eat food on campus. Download Carleton Mobile, the Carleton University mobile app. Carleton Mobile is available for iPhones and Android phones. Students can use the app to view their class and exam schedules, access grades, and navigate campus using the campus map. Prepare to move in to Residence. Students who are moving into residence should review the move-in guidelines and recommended packing list. Students should also take note of the following dates. A full academic calendar is available online. I-Start Orientation is mandatory for all new international undergraduate students. *Students must attend one I-Start session between Friday, August 31 and Friday September 7. Fall Orientation provides incoming students with a week of fun activities and an opportunity to gain skills that aid the transition to university. **Sprosh runs from Sunday, September 2 to Saturday, September 8. **EngFrosh runs from Sunday, September 2 to Sunday, September 9. Academic Orientation is mandatory for all new undergraduate students. This is the first day of class. Students will attend their Wednesday classes.